At first glance, this puzzle by Kennet Walker of Rivermore, California doesn't seem unlockable. The five pieces, however, can most certainly be taken apart. Putting them back together, however, is a whole new problem in itself. My suggestion for solving this puzzle would be to not apply too much pressure. 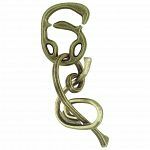 Solve it or not, the five pieces exude a kind of elegance, spiralling into a comfortable fit in the palm of your hand. The key word is 'spiral'. 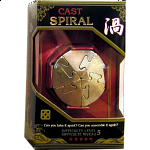 People who purchased Cast Spiral also purchased the following puzzles. A nice puzzle for a classical mechanism but it is the cheapest and a beautiful version of it. The theme of a spiral, with the circle shape besides of the classic square is a good idea. The solution is easier than it may appear because there is not much to try and everything is seeable, it is a puzzle you can jiggle around with a little then solvie it only by thinking with the puzzle staying on the shelf. 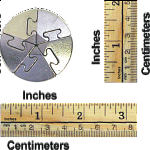 Interesting puzzle, but a bit heavy to carry around in your pocket. Took a while to get apart at first, but once known, the solution is fairly easy. Then there is the matter of putting all the pieces back together. I like this one a lot. At first I found it hard to believe the reviews that said people had found the answer accidentally and quickly, but I've had several people try it and a few have done just that (although they don't seem to understand what they did !) I've found that those with a scientific or analytical mind seem to have *more* trouble with it. That was certainly the case with me. I didn't give it five stars because it is possible to stumble into he answer, and also because of the rough finish. This one is my paperweight right now. Not a bad puzzle but i would say its rather 6 to 7 difficulty and no way 9 solved it in 20 minutes and i would say that i am rather slow in solving puzzles. i liked very much the way that it feels in the hand. This is one of the most original Cast puzzles. You can play whole day moving the pieces up and down the spiral. But only one special trick takes them apart. Putting them back together is like solving a jigsaw. Just try them to check which match and you are done in less than several minutes. I like it, though it is much for level 5 (level 9 in this site). I am starting thinking that they rate the idea behind the puzzle rather than the time needed to solve it. I saw one in a second hand store. Took it apart in less than two minutes. Putting it back together was the hard part. It took me about ten minutes to match the pieces. Too easy to be level 9. I was expecting this to be one of your easier puzzles. A lot of fun though. Will show it to my friends..
fun puzzle! taking it apart: level 1, puting it back together: level 5. nice design. Another easy puzzle but it's got a really cool design. *Much* too easy to be a Level 5. I solved this in just a few minutes and a couple of non-puzzling friends have done the same. Reassembly isn't any harder, provided you're careful when you take it apart the first time. This should be, at most, a Level 3. That being said, the puzzle has a fantastic feel in the hand and is enjoyable just to play with. It also gives an initial impression of being obviously impossible, which of course doesn't turn out to be the case. That's fun too. Great puzzle, dinged a star only for the terribly inaccurate difficulty rating. I got it when I was seven years old. I quikly solved it... Then I spent next five years trying to put it back together... I reallly like it, but I can't say anything about the difficulty level, that everyone has been whining about because I only have this and the Cast Cage. Very easy, not TOO easy but it is awesome for a puzzle collector like myself because of the shape and it is also great to juggle around while going through everyday life. Mine got stuck :( the puzzle was perfect, it was just a cousin of mine who didn't know how to put it back together and forced it :( I will undoubtedly by another one soon. Really loved it. But its difficulty is overrated. A very interesting puzzle with such unique mechanism that often make jaws drop for those who try it for the first time. 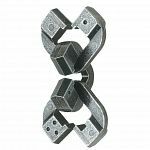 It is decently sturdy with adequate weight, and the solution is very elegant, requiring out-of-the-box-thinking. As others said before, the spiraling staircase patterns that one can make out of it are truly amazing. The unique shape with jigsaw-like indents are sure to catch the player's attention and the enjoyable gameplay makes that attention stay there until the puzzle is solved. A good advice from me and the previous commenters: If you (or the person you gave it to) succeed in taking it apart into 2 sets of pieces, then STOP immediately. 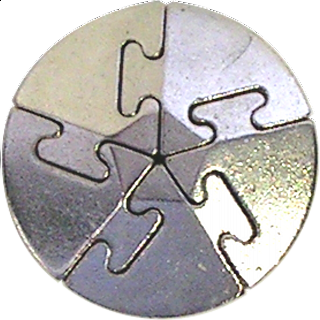 The five pieces differ only by hundredths of millimeters or so, but it means you can only put them back together after a good 15-30 minutes of trial-and-error if all pieces get separated and mixed. And if you try to put together two pieces that don't want to get together, then they may become stuck together (this is called the Cast Spiral Paradox). This was a very fun brainteaser, My Friend had a go first, she got it into all the seperate pieces and didn't know how to get it back together, so i spent hours trying to get it back together, as soon as i got it, it became so obvious to me how it was to be solved, it has been the funnest Brainteaser i have had so far. I love this puzzle. It's really hard to put this one back together. Even after knowing the solution, I still seem to put the pieces back incorrectly quite often. This is fine, but what bothers me is that if you hand this puzzle off to a friend it often just falls apart in his/her hand while they are messing with it. Since people have no idea how they took it apart, they are now EXTRA stuck on trying to put it back together. Then I'm stuck trying to reassemble it. I give this puzzle a low rating only because its difficulty level is completely wrong. There is NO WAY this puzzle is a Hanayama 5 (puzzlemaster 9 - gruelling). A 2 or maybe 3. Taking it apart is really easy. Putting it back together is a little harder unless you pay attention to one piece, then fit the others around it properly. It is a reasonably elegent puzzle for one this simple. Just shouldn't have this rating. I'd give this one a skill level 7. Too easy for puzzle die hards. But its look/feel/movement makes it a great coffee table/conversation piece. Only time will tell if my friends/family can jam it up like Lisa mentioned. I agree this puzzle is not of highest difficulty. The most difficult part is convincing yourself it is possible to disassemble - it seemed impossible to me, at first. Harder to put back together, best follow the solution for this so it doesn't get stuck, or be careful. Yeah, this one wasn't too tricky. Should be 7 or 8 maybe, Vortex was tougher. The spiral-staircase pattern that it forms is quite visually appealing though. It took about 15 minutes to get it apart and a bit longer to get it back together.